Works well with computers, laptops, Blu-Ray players, cable boxes, PS3, Xbox 360, Wii U, Nintendo Switch, etc. "10 Cheap HDMI Switchers (Under $50) Ranked from Best to Worst"
by Tom's Guide Read More "How To Use An HDMI Switcher For Multiple HDMI And Input Sources"
by Over The Air Digital TV Read More "Best HDMI Switch"
by Thoroughly Reviewed Read More "Essential HDMI Switches for Connecting Multiple Devices"
"Top 10 Best HDMI Switches in 2018 Reviews"
by All Top 10 Best Read More "Fosmon HD1831 3-Port HDMI Switch Review"
Ran out of HDMI ports on your HDTV/monitor/projector? Want to reduce the mess of cables connected to it? 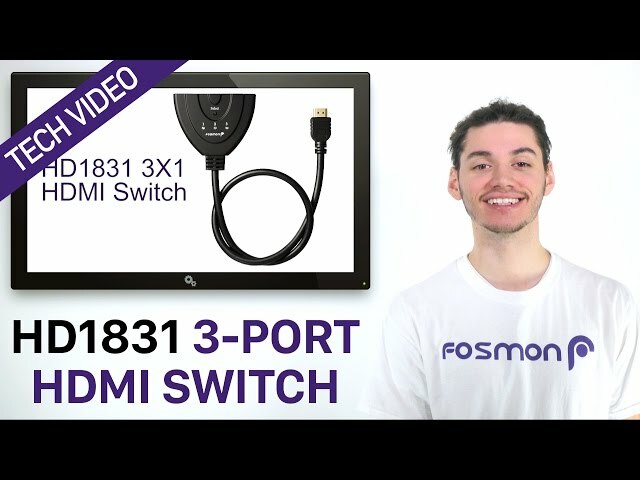 Fosmon's 3x1 HDMI Intelligent Switch with Pigtail Support will take care of these problems. It has 3 HDMI input sources to provide plug-and-forget auto sensing capabilities that automatically switch inputs when a signal is detected. A button to manually switch between the 3 sources is also built-in. No power adapter is necessary to make this switch work, as long as the connected devices supply sufficient power. HDMI cables have the capability to deliver power from connected sources. Up to 1080p, HDCP 1.0/1.1, 12-bit Deep Color, 3D, and uncompressed/compressed audio formats are some of the newer HDMI features supported on this switch. The 24K gold-plated connector on the 20in / 50cm cable resists corrosion and reduces tarnish.